Category Archives for "Blog Monetization"
Many of you might have heard of Google AdSense. If not, Google AdSense is the most popular and probably the best contextual advertising program. Google AdSense is most popular among the bloggers for monetizing their online content. Though there are many AdSense alternatives but no one could beat Google AdSense. For getting paid, AdSense ads must be placed on your website and clicked by your blog visitors. You might have noticed AdSense ads on very popular blogs and websites. You can make decent money from your blog by using Google AdSense. In this article, I will be discussing how to create and apply for AdSense. Creating AdSense account is quite easy. First and the most important thing is you need to have a blog or website. Your blog or website must contain minimum 10 pages and should not violate any Google AdSense policies. Also, you must be 18 years of age to apply for AdSense and if you are not you can use your parent’s name to apply for AdSense. Wait while your account is being reviewed. Before applying make sure your website is not violating any of Google AdSense policies. And if it does make sure to fix that first and then apply for AdSense. This ways your AdSense application will have higher chances of getting approved. First of all, go to AdSense homepage and then click on signup button. Now you need to complete AdSense application form. Step 1 : You need to select your Google account to continue. You will see two options. First is to continue with your existing Google account and second is choosing a different or new Google account. Select the option you like. Step 2 : After selecting your Google account, you will be to tell about your content. Here you will be adding your website details. Simply enter your website address but without http:// and select your content language and click on continue. Step 3 : In this step you need to add contact information. Make sure to use payee name same under which you have your bank account. please note that you will not be able to change the payee name after signing up in some countries. So make sure you must have exactly same payee name and bank account name. I will not click on ads nor encourage others to do so. I will not place ads on sites that include adult content. I do not already have a Google AdSense account. Make sure not violate any of the Google AdSense policies otherwise your account will be suspended and you have very few or probably no chance of getting your AdSense account back. Step 5 : Once you have signed up for AdSense, you need to place AdSense codes on your website or blog. This is very important steps as AdSense team will review your application and website. Now just wait for AdSense email to arrive. It can take 24 hrs to months. You need to fill tax form depending upon if you are US Citizen or Non-US Citizen. Once your earning reached a threshold of $10 in your AdSense account., then AdSense will mail you a pin to your address. Now login to your AdSense account and enter your pin. That’s all, now your account is created successfully and once your earning reaches $100 you can receive it. 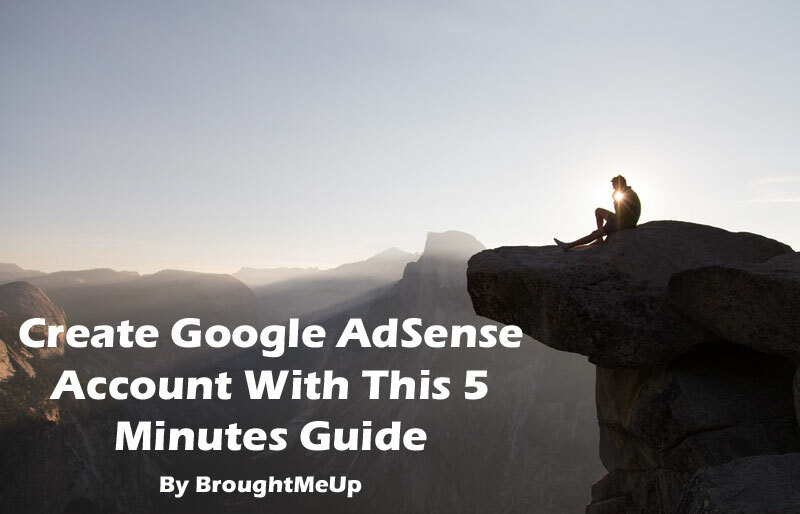 I hope this guide helped you in successfully creating your AdSense account. If you don’t have any blog then consider reading these following articles. Guide to create free BlogSpot/Blogger blog. Guide to create WordPress blog on various hosting. If you have any queries please let me know via comments. Check us out on Twitter and Facebook. Also, do subscribe for updates.